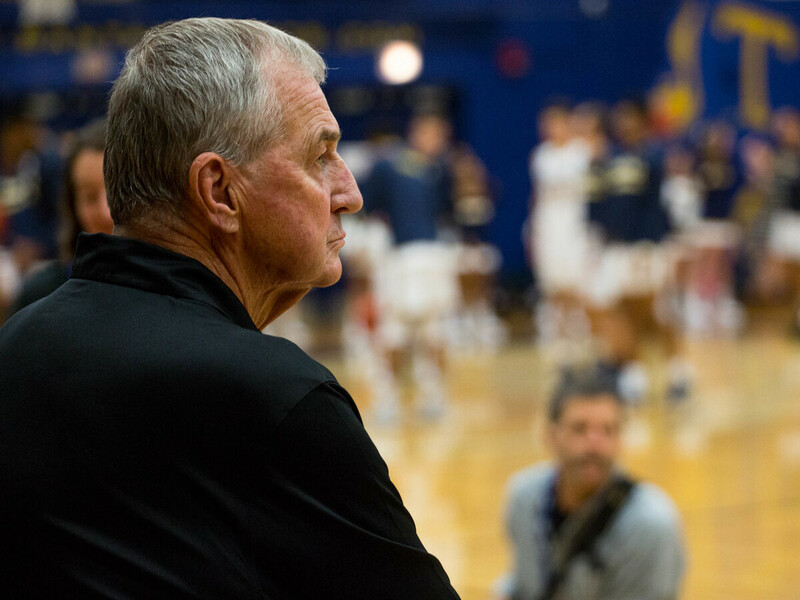 'Seduced By The Game' - Hall Of Fame Coach Returns To The Court Jim Calhoun won three NCAA Division I Championships while coaching the University of Connecticut's men's basketball team. Six years after retirement, he's back coaching at a small Division III school. Jim Calhoun retired from the University of Connecticut in 2012, but has now returned to the game as the head coach of a NCAA Division III program in West Hartford, Conn.
Hall of Fame basketball coach Jim Calhoun has returned to the bench — six years after he officially retired. He's back, not to navigate a powerhouse program, but to coach at a tiny NCAA Division III school that was an all-women's college for 86 years. "I think the only person it matters to is my accountant," Calhoun joked. Calhoun, 76, now coaches at the University of Saint Joseph. It's a school in West Hartford, Conn., that's located just 30 miles from the Division I University of Connecticut, where Calhoun racked up three NCAA championships and 873 wins. I'm seduced by the game I love. I'm seduced by the idea of teaching. I'm seduced by the idea of watching kids grow and seeing how athletics can fit into that. And so, if you want to call me an addict, I'm an addict to the game that did so much for my life. 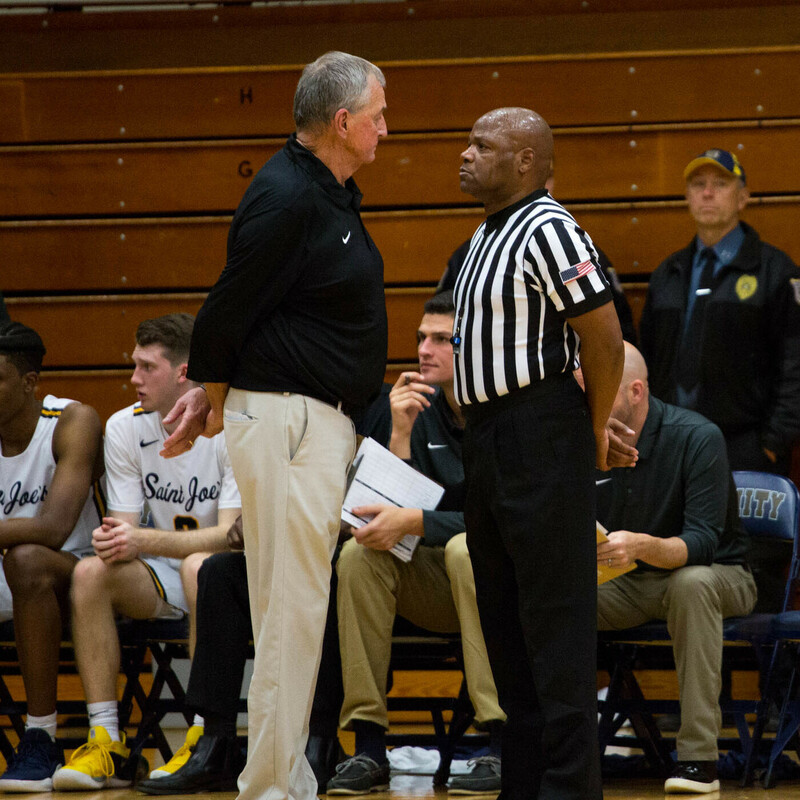 Even though Calhoun has returned to coach a bunch of unheralded Division III players that are mostly freshman, he says that basketball is basketball. The opportunity to be around that kind of excitement was too good to pass up. "I'm seduced by the game I love. I'm seduced by the idea of teaching." Calhoun said. "I'm seduced by the idea of watching kids grow and seeing how athletics can fit into that. And so, if you want to call me an addict, I'm an addict to the game that did so much for my life." On November 9 USJ played its first-ever men's college basketball game. It was a home game, but because the school's gym has a capacity of 406 people, it had to be played at a larger venue in nearby Hartford. Bill Cardarelli is now the athletic director at USJ. He was Calhoun's former assistant coach at UConn and was instrumental in plucking the coach from retirement to lead the Blue Jays. "He's a program builder and he really, really enjoys that," Cardarelli said. "He did it at Northeastern [University]. He did it at UConn. He saw that challenge here." At Northeastern, Calhoun scored his first collegiate head coaching job in 1972. He moved on to UConn in 1986. There, his teams won NCAA Division I national championships in 1999, 2004, and 2011. During Calhoun's first game at USJ, it didn't take the veteran long to transform into the Jim Calhoun of old. Calhoun admitted that he was "amped" during the first game back November 9. He even received a technical foul from an official. But he didn't think his treatment of the referees was unusual. "Most good officials understand I'm competing," Calhoun said. "I don't think I was extraordinary." He called a timeout with a four-point lead 41 seconds into the game. As his team went down by double digits, he went after the refs. And then, he picked up a technical foul. In the stands were two long-time UConn season ticket holders that came to watch Calhoun's return to coaching Software engineers Keith Amato and Mike Biehl sat next to each other in the bleachers. "He's bringing the passion back," Biehl said. Biehl was wearing a UConn hat and sweater. Amato, his friend, marveled at watching Calhoun coach from a wooden stool. "He's up and down. He's working the refs hard. He's giving the team a hard-time. He's back where he needs to be." Calhoun's men trailed by 11 at the half. But they fired up and attacked the dribble in the second half. The Blue Jays won 79-74 in front of 1,800 people — a huge crowd for a Division III game. Calhoun admitted afterwards that he was amped for the first game. He also addressed a reporter's question about whether he'd be nicer after being away for six years. "A kinder, gentler Jim, gotcha. Wrong," Calhoun said. He knows his team won't be in the national spotlight any time soon. But, that's not why he took the job. While some might see him now as a big-time coach at a small-time school, for Calhoun, it's about getting back on the court with 20 players who just want to play.